My Bookish Ways interviews Marcella Burnard. The Qwillery interviews Suzanne Church. Buzzy Mag interviews Jana Oliver. Lawrence M. Schoen interviews Daryl Gregory. Europa SF interviews Ian McDonald. SFX interviews Daniel H. Wilson. Start Publishing interviews Neal Asher. Science Fiction interviews Mike Flanagan, Trevor Macy, & Jason Blum of Oculus. Civilian Reader interviews Jay Posey. Vaporteppa interviews Michael Swanwick (in Italian, or poorly Google-translated here). AI-AP interviews artist Jeffrey Alan Love. Several Women Arrested For Writing Fanfic In China. Farscape Movie Is In the Works. The entire The Wheel of Time series will be made available in the Hugo Voter Packet. May Madness Flash Fiction Contest. Book Launch Party for Hollow World by Michael J. Sullivan! SCI-FI-LONDON Film Festival Shorts Programme 4. Mind-ALTERING t-shirts by The Strange Company. Carl V. Anderson on And the Nominees Are. Ferrett Steinmetz on The Problem With The Hugo Awards. Ferrett Steinmetz on White Dudes Getting Award Nominations. Fred Kiesche on Hugo Nominations. Foz Meadows on The Hugo Thing, And Other Fairy Stories. Jamiam on The rest of the 2014 Hugo Ballot..
Jed Hartman on Hugo nominees 2014: Gender notes. Jim C. Hines on Hugo Wars, Part CCXVIII. Joe Sherry on Preliminary Thoughts on the Hugo Award Nominees. John Birmingham on Oh Hugo, you’ve done it again. John O’Neill on 2014 Hugo Award Nominees Announced. John Wiswell on Everyone’s Angry About the Hugos. Liz Bourke on How About Those Hugos? Natlie Luhrs asks Do I Dare Disturb the Universe? Niall Harrison on Hugos 2014. Patrick Hester on On Being Nominated for a Hugo Award. Mary A. Turzillo on Roger Zelazny. Jaym Gates on Flash Fiction Challenge: Round 1! Gail Z. Martin on Plotting out the Plot. Paula S. Jordan on Building Aliens. Lisa J. Goldstein on The Best First Sentence in the World. Steph Sinclair and Kat Kennedy on The YA Roundup: More Movie Trailers to Make You Cry. My Bookish Ways on Authority (Southern Reach #2) by Jeff VanderMeer. Andrea Johnson on Three Parts Dead by Max Gladstone. Ria Bridges on The Best Science Fiction and Fantasy of the Year: Volume 8 edited by Jonathan Strahan. Jonathan Strahan on Half a King, Joe Abercrombie. 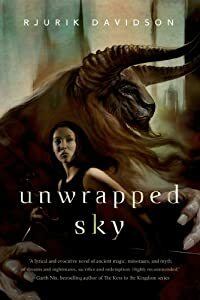 John Clute on Lagoon by Nnedi Okorafor and Lockstep by Karl Schroeder. The Gog on So long, Cosmos. Robert Jackson Bennett on How to get an agent. Graeme McMillan on The Cult of Orphan Black. Brian McClellan on The Importance of Pre-orders. George Dvorsky on 10 Futurist Phrases And Terms That Are Complete Bull. Michael J. Sullivan on Innovations in Book Translations. Blastr on These 3 Batgirl redesigns should make DC stand up and pay attention. Ryan Britt on Robots for Dummies? The Real History of Science Fiction. Kevin Hearne on How you help authors the most. Joachim Boaz on Guest Post Series Announcement, The Science Fiction of Michael Bishop. S.L. Huang on The story behind Zero Sum Game. Yancey Strickler on Life and leadership lessons from Dungeons & Dragons. Open Culture on Orson Welles Tells Some Damn Good Stories in the Orson Welles’ Sketch Book (1955). Tish Wells on BBC America’s ‘Real History’ is Science Fiction 101. Diabolical Plots lists The Best of Clarkesworld 2013. Frank R. Paul – Amazing Stories‘ Amazing Illustrator. The Art of John Silva. The Dorkly Fan Art Expo: The 40 Pieces of Fan Art You’ll See There. Check Out the Cover Art for Brandon Sanderson’s Firefight. All Men Must Die Game of Thrones posters . 7 Covers Gail Carriger Loves. The Boost (Excerpt) by Stephen Baker. The Space Project: contemporary space music infused with Voyager recordings. Weird Fiction: The Passing of the Generational Torch (NecronomiCon keynote with H.P. Lovecraft scholar S. T. Joshi). Help Scientists Record One Day of Sound on Earth. Why Science Fiction is Important on Earth Day. Google Maps meets Game of Thrones in interactive Westeros map. Harry Potter Cyber Punk Adventure: The 1980’s Anime. Walk Through STAR TREK VOYAGER With Oculus Rift and Unreal Engine 4. The Hugos and the reactions to it. This is why we can’t have nice things. Actually, this is why awards are nothing but high school brought into the adult world. The way people react to something they disagree with is an embarrassment for adults. Vox Day, Larry Correia and everyone else can go pound it. I read because I enjoy reading, not because every breath I take needs to be a political statement. If authors want to lose an audience by being little children then go right ahead and keep doing what you’re doing. You will find that more and more people will go to the no-name writers and their cheapo e-books. The less I know about the personal lives and convictions of an author, the happier I am. Awards are important to them. They mean zero to me. Thanks for the link, John.